As citizens breathe visibly hazardous air in Kosovo once again, institutional initiatives are not curbing the danger to public health, and the problem always leads back to lignite. Just under 4,000 Kosovo citizens die prematurely every year from exposure to harmful emissions from the country’s thermal power plants, coal-based heating and traffic, and the Kosovo government has attempted to lower its reliance on the fossil fuels that cause it in the past 12 months. Last Tuesday, the government approved the proposal of the Minister of Environment and Spatial Planning, MESP, Fatmir Matoshi, to ban the use of coal for heating in all public buildings at central and local levels, one of the key objectives of the World Bank’s Energy Efficiency and Renewable Energy agreement with the Kosovo government. This decision follows the approval to ban coal-based heating in Kosovo schools in August this year, a promise made by former Minister of Environment and Spatial Planning, Albena Reshitaj in December last year. However, in October, the Assembly Committee for Economic Development increased the maximum age of second hand cars imported into Kosovo to 15 years, which if implemented, would see an inflow of cars with outdated filters. 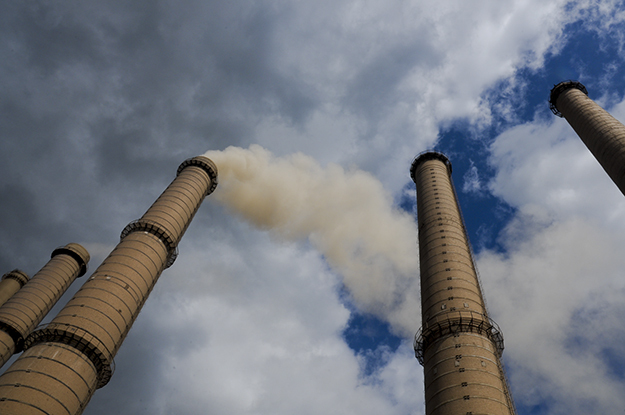 According to experts, substituting coal for wood-based heating is both unaffordable and unsustainable, and the effects of coal-based domestic heating and pollution from traffic are a drop in the ocean when compared to the emissions of Kosovo’s coal-based thermal power plants. Thermal power plants in Obiliq. | Photo: Atdhe Mulla. The former environment minister emphasized in February that air pollution cannot be solved with a “magic wand,” but measures to improve Kosovo’s air quality are finding their roots, and moving slowly towards alternative sustainable heating sources is becoming a reality. This does not mean that Kosovo is prepared for a renewable-dependent future. Researchers from the Institute for Development Policy, INDEP, say that unrealistic policies failing to prioritize public health continue to exacerbate the pollution that has clogged Prishtina for decades. Minister for Economic Development, Valdrin Lluka, pledged to find alternative sources of heating for homes and small businesses, as well as focus on reducing dependency on fossil fuels in public facilities last December during BIRN’s televised program Jeta ne Kosove. Hollaj emphasized that using wood and coal as a source of fuel for heating can lead to poor air quality within heated spaces. The Municipality of Prishtina banned the sale of coal used for heating homes and private businesses following the protest earlier this year as part of the emergency measures taken to improve the air quality, which continues to be in force, yet the unmistakable smell of coal and the sight of the smoke remains. Despite Lluka’s insistence that domestic coal-based heating is a huge problem, Shllaku said that it has minimal impact, and alternative policies that have surfaced in the last year will harm public health even more. “To make it seem like a really attractive situation, they go to the kindergartens, substitute their heating system from coal to wood and make another big mistake. The wood is a bigger polluter than the coal,” he said. 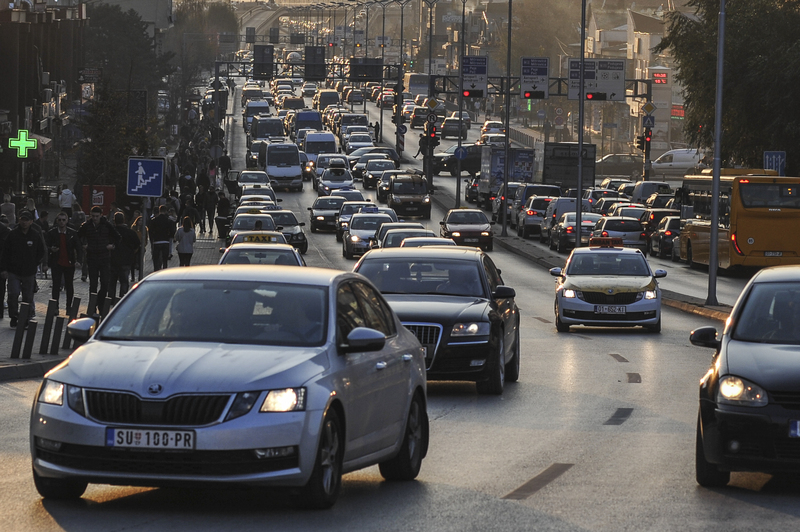 Cars old and new flood the streets of Prishtina every day, and the Assembly Committee’s decision to increase the maximum age of imported cars to fifteen years will make emissions more harmful than EU regulations on filtration systems would allow. Traffic in Prishtina in November 2018. | Photo: Atdhe Mulla. Earlier this year, after citizens organized a protest demanding measures to clean the air, a the municipality of Prishtina banned all cars in the center of the city for less than two days as a short-term solution. Hollaj explained that vehicles so old discharge harmful pollutants that negatively affect air quality, and the measure to approve their import is inconsistent with ongoing policy making processes, including the government’s 2019-2028 Climate Change Strategy and the Integrated National Climate and Energy Action Plan. Hollaj stressed that the affordability of older cars for citizens who cannot afford new ones cannot be used as a justification for the implementation of this policy. She said that the government has the ability to make cars that fall within the EU’s permissible emissions standards more affordable for Kosovo citizens. Improving the air quality would be made easier if electric cars and hybrids were encouraged, by removing excise tax, customs and VAT as well, according to Hollaj. “It’s easier to blame traffic than the thermal power stations. Blame the stations, then you have to act. Act, and you have to stop them. Stopping them means importing electricity, and electricity is damn expensive,” he said. Shllaku’s ‘bigger picture’ requires thinking beyond cars and coal, and towards the climate: he points the finger towards Kosovo’s weather for exacerbating the pollution that plagues the city each winter. Kosovo has a specific meteorological condition in the winter, he explained, where the complete lack of vertical or horizontal wind mixed with the incredibly cold temperatures results in ‘temperature inversion,’ the creation of air channels at the ground level where harmful fumes and emissions become trapped. This is the fourth biggest contributor to air pollution, Shllaku explained, after the power plants, coal burning and traffic, but will always be part of the problem where emissions from non-renewable sources continue. The government has turned its head towards investments in renewable energy in face of the growing disenchantment with coal-based energy sources. With Kosovo’s mandatory target of 25 per cent of energy production coming from renewables, and pressure from the EU to improve their targets in 2017, there has been an increase in cooperation with foreign and local investors to develop wind and solar power. The government published a renewed Renewable Energy Strategy earlier this year. The country’s 2020 solar power production target been raised from 20 MW to 30, while largest share is expected to come from small and medium hydro power plants, at 124 MW. The total future capacity for wind farms is 150 MW according to the strategy, and plans for these are in motion. In October, a wind farm with a 32 MW capacity was launched, expected to produce 110 million kilowatt hours per year, which would cover more than 10,000 households annually. At the end of May this year, SOWI Kosovo, a Kosovo-German company specializing in the construction of wind and solar energy projects, signed an agreement with KOSTT to construct a wind farm north of Bajgora and connect it to the power grid of Kosovo. Hollaj said that the 105 MW wind farm is expected to be online in 2020. The Minister of Economic Development pledged in a press conference in October to transfer the source of 100 MW of energy in Kosovo from its hydropower capacities, which have been condemned for causing degradation to the environment and squandering Kosovo’s minimal water resources, to wind and solar power. The hydro power plant in Decan. | Photo: BIRN. Shllaku, on the other hand, proposed greater reliance on hydropower construction, rather than other renewables, as the realistic solution. 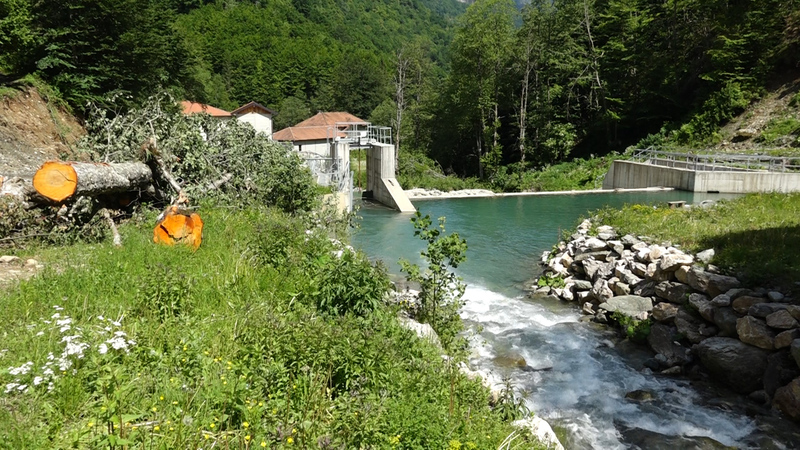 If the government were to reach a concessions agreement with Albania to construct hydropower, he said, the country could receive some power in return from Kosovo’s thermal power plants in the summer when the snow and rainfall has run dry and hydropower electricity becomes scarce. Shllaku emphasized that similar models have worked before. In 1972, former Yugoslavia and Romania constructed and shared the Iron Gates hydropower plants along the Danube River. Shllaku’s theory for hydropower capacities in Albania is part of a long term, 50 year transition phase towards eventual renewable dependency. But there is no space at present to abandon coal-based energy sources, said Shllaku, and Kosovo should continue to support the development of the coal-based thermal energy sector. Coal-based power plants: ditch or develop? This support for renewables comes just weeks after the withdrawal of World Bank support for the construction of the new coal power plant, Kosova e Re. “We have made a very firm decision not to go forward with the power plant, there are bylaws to go with the lowest cost option, and renewables have now come below the cost of coal, so without question, we’re not going to do that,” said President of the World Bank Group Jim Yong Kim at an annual World Bank and IMF town hall meeting with civil society groups in Indonesia at the beginning of October. According to news agency Reuters, the London-based company that won the tender to construct Kosova e Re in 2015, ContourGlobal, will continue to look for alternative funding despite the withdrawal of the World Bank’s support for the project. In October, Lluka emphasized that the replacement and rehabilitation of Kosovo’s “conventional generator capacities” is a priority for the Ministry of Economic Development, focussing on replacing the oldest lignite power plant, Kosovo A, and securing investments to reduce emissions from the Kosova B power plant, which he said emits 20 times the amount of emissions that standards should allow. As a solution to the high concentration of pollution felt in Prishtina from the power plants, Shllaku recommends terminating Kosovo A and replacing its capacities with a plant in the Dukagjini valley, where there is 2 billion tonnes of lignite reserves, enough water to sustain the plant and, far from Prishtina, its location would balance out the dangerous levels of emissions. Provided Kosovo A is terminated, the difference in air quality would be enormous, said Shllaku, particularly if paired with an agreement for increased wintertime hydropower capacities in Albania for Kosovo, in return for summertime coal-based energy for Albania. While this proposal is nothing new, it is a risky one, said Shllaku. Unless the focus moves to making change of this magnitude, Kosovo will fall behind.